Eluding a Gadsden City tackle, senior Hunter Gibson runs for the endzone. 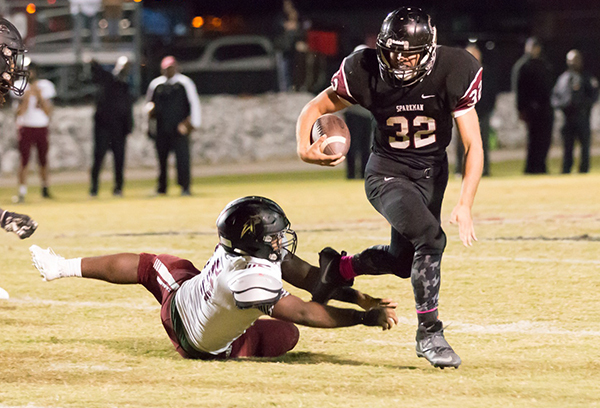 This football season is playing out to be one of Sparkman’s best seasons if not Sparkman’s best season so far. Coach White and the Senators have already secured the first winning season and playoff qualification since the 2006 season 11 years ago. Sitting at number three on the 7A region four standings, the Senators have only lost to two teams: Bob Jones (6-3) and Hewitt-Trussville (8-0) both by less than a touchdown. The biggest change from last year’s tenth consecutive losing season to now is the addition of a 148-30 overall head-coach, Laron White. In the time that he’s been with the Senators he’s earned the respect and admiration of his new players. With the head coach change, positive results have included a clinched playoff spot, winning record and several player of the week awards to multiple players. The most recent player of the week award went to Ethan Caselberry, who picked off three passes in a 38-13 victory over Gadsden City last Friday. “It’s really an honor to know that the work I’m putting in is being awarded,” Caselberry said. White brought new playcalling to Sparkman with play calling that mixes with what players want to run and what the coaches want to run. This has been said to be an attribution to the Senators offensive success this season. T defense is one of the best ever allowing less than 35 points every game and the offense led by Devin Kimbrough and Hunter Gibson scores enough to average 24 points a game. Sparkman has never had a lack of talent and with a playoff caliber coach the talent of individual players is able to shine with a winning record.